As mentioned, I have used your service last year for a Far East Organization event at MIRO. Today, I'm attending my best friends' father birthday and decided to give him a special gift of a portrait of him in caricature. You can help me decide which kind of caricature and how it will looked like. Basically, I need it to be done tastefully with Special Touch. Meaning, one that he will certainly like. 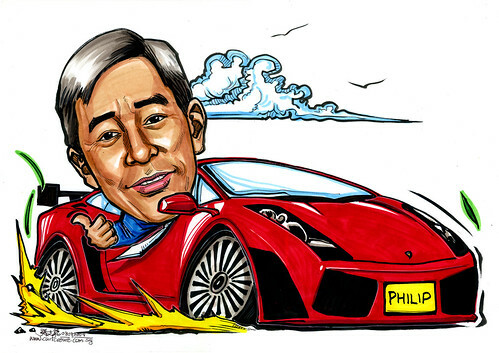 Numberplate, maybe put his name, PHILIP"
Very urgent job. 3 hours delivery. I was having lunch with my family when I received this client's call. Got to rush back to start work on this, as I have another order due this evening too.